This week’s tip to drive traffic to your website gives your site visitors something useful… while allowing you to keep in front of them with a branded message. The site is dedicated to helping “Clear The Air,” and getting the word out about air quality, and gives tips for what an average person can do (including idling your car less), and offers resources for schools, employers and commercial trucking operators. 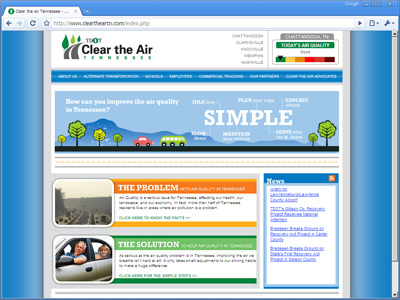 A Mini-Web Application: At the top of the website is an air quality meter, that allows a person to click on their city, and then have the site display the air quality for the day: When someone clicks on Chattanooga, for example, the system then displays the air quality for this town. The system also sets a cookie on their computer, so when someone returns to the site, they’ll automatically see the air quality for their selected town.